There are tons of biopics or life story movies. Some cover brief important periods of someone's life while others are biographies that cover a good portion of a person's life from childhood to death. Some digress wildly from the truth while others stay relatively true to the source with a few liberties added for greater entertainment value or more dramatic effect. No matter what, if the story is told well I love life story movies. The Jolson Story (1946) -- I loved this film when I first saw it at about age 10 or so. I still love it. A few years back I got a couple of Jolson biographies from the library and was disappointed to find that much of the film was fabricated. His true story was more interesting than the movie. Still, it's a great film and I still love it. One of the best show biz pics ever and an excellent biopic. Yankee Doodle Dandy (1942) -- Another great show-biz biopic about a Broadway and songwriting legend George M Cohan. Tons of classic songs and fabulous dancing by tough guy James Cagney--what a dancer he was. This is one black and white film that deserved to be colorized, but either way you see the film it's well worth your time. It gives you a great patriotic uplift as well. Sergeant York (1941) --Gary Cooper stars as soft-spoken hillbilly hero of World War One. Due to his Christian beliefs he does not want to fight, but when he realizes that sometimes we have to fight to be free he puts his sharp-shooting talents to work and captures 132 German soldiers on his own. Another great American story. Amadeus (1984) --Funny, tragic,and utterly great. This biopic of composer Wolfgang Amadeus Mozart deservedly won eight academy awards. The music's not too bad either. The Elephant Man (1980) --This biopic directed by weird film director David Lynch tells the tragic story of the grossly deformed John Merrick who in 19th England goes from persecuted side show freak to a darling of British high society. The film is dark, thoughtful, and sad. It is also highly enthralling. Well worth your time if you're ready for some depression. What are some of your favorite biopics? Does it bother you when the film takes liberties with the true story? Who do you think deserves biopic treatment? I remember watching Yankee Doodle Dandy late at night on the 4th of July with my family. I agree that James Cagney was wonderful in the role. I think that they still show it during the holiday. Thanks for another great week Lee! to me James Cagney portrayed the character wonderfully yet it was not his usual acting style. I little embellishment is all right. Real life isn't that exciting. Patton is a great movie. Life Story movies often have great lessons in them. And reveal things we didn't know about some of our icons. Probably Yankee Doodle Dandy was my favorite here. And I hate it when movies veer from accuracy in life and from a book! Great choices, all. Let me add "Brian's Song". Need I explain? I enjoyed Amadeus. Great film and, I agree, great music. No one ever sang Yankee Doodle Dandy like Cagney! I loved Amadeus, but tend to think of it more as a Salieri biopic (and so relatable for all us creative types) than a Mozart one. Yes, embellishment keeps us enchanted. We do need a bit of dazzle! That Elephant Man film sounds like something that's worth checking out. I think that the problem with these films is that they're constricted to only being as good as the people that they're based on, if the lead person the movie is based around is interesting then the film will be interesting too! Julie -- Yankee Doodle Dandy is a great film for the Fourth. Yvonne -- I think Cagney was better as a dancer than a gangster. Alex -- There have been many great sports biopics. Mood -- I've yet to see Patton. Shocking I know. Sheena -- And sometimes they don't tell the real story. If I have liked a biopic I will often read more about person afterward to see how accurately the movie portrayed them. Donna -- If the story done well I can enjoy it, but I like the truth. Jack -- I know Brian's Song is highly regarded, but I've never seen it. Daft -- Some of the best music ever! C.Lee-- Cagney belted out the tune in a classic way. Tui-- You might say that Amadeus was a bi biopic--a tale of two lives. Ella -- Sometimes the real story is all the dazzle I need. Yeamie -- The story of John Merrick is a compelling one. I also read an account of him that brought tears to my eyes. I don't read many life stories. I can't even think of one I want to read. 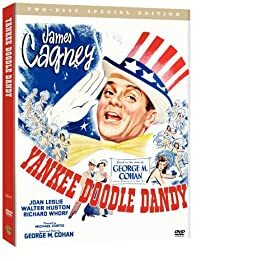 I saw 'YANKEE DOODLE DANDY' for the first time about 7 months ago at my Brother's suggestion (a big Cagney fan) and I was surprised how much I enjoyed it, since on the surface it didn't seem like my type of movie. Yes, 'SERGEANT YORK' was good; 'Amadeus' was great (I own that one on DVD). I probably saw 'THE ELEPHANT MAN' four times when it was playing in the theatres but not since then. Should rent the DVD and see it again all these decades later. I generally dislike War movies, but 'PATTON' definitely should be seen. I know you're not into sports at all, but the people above who named 'BRIAN'S SONG' as a good biopic are certainly right. Perhaps my all-time favorite biopic is 'RUDY' - about the undersized, overachieving football player who was simply determined to play for the Notre Dame team. Yeah, it's a sports movie, but please trust me this one time and see the movie, Lee. God knows I love 'RUDY'. Everytime I see that movie (which I own) it makes me ashamed that I gave up on my own dreams. Lee, I'm going to use a football term that I'm sure you won't be familiar with, and don't look it up because it will then be a "spoiler": At the end of the movie, Rudy records a "sack". I thought no way could that have really happened; the filmmaker was exaggerating! So afterwards I looked it up and found out that the real Rudy really did get a "sack", which put him in the Notre Dame record book forever. It was that little detail that solidified 'RUDY' on my list of all-time favorite biopics. I am not up, once again, on the older films. But I did see Amadeus. That was a great movie. I also liked the sports films that Alex mentioned in his comment. The Blind Side is one of my all-time favorite movies. I liked your picks. Great life stories. though the story obviously intertwined with Mozart. The Elephant Man is epic. Susan -- Life stories are great because they are real. You're missing out! StMc -- Sports movies are not my go to genre, but I do usually find them very inspiring. I too own a copy of Rudy and think it's a wonderful film. Same with The Blind Side. Sports movies typically provide a story of someone who beats odds to achieve greatness and I enjoy that kind of a message. Robin -- You should dig into the back shelves of filmdom and see at least a few of the older classics. Some wonderful stuff there. Desert-- Thanks for stopping in. Susan -- Yankee Doodle Dandy is a show biz classic. I'd add it to a must see list. Haven't seen any of those except Amadeus and I loved that one. I nominate The Truman Show. I am embarrassed to say that my favourite is probably Roxanne, with Steve Martin - I had just given birth to my daughter and in those early weeks I needed some distraction from having no sleep and it made me LAUGH. So yes, I can confidently say i don't care at all if it is near the real life story. But if it was about someone I knew I suspect I'd change my mind! I grew up with those movies, my dad was a huge fan of cinema. Cagney was wonderful in Yankee Doodle Dandy, but I loved him best as a bad guy, he was such a great gangster. Thanks for bringing back good memories of movies with my dad. I think my favourite was Sergeant York although I enjoyed all the others. I also loved The Benny Goodman Story and The Glen Miller Story. The "Elephant Man" and the life of "John Merrick", is one of the most bitter sweet movies I ever saw. It brought tears to my eyes. Polite note, check your link, Lee. "David Merrick is incorrect. Tina -- Well, The Truman Show is not real, but it is about a life. I keep meaning to watch that movie again. Liz -- Roxanne is a good film, but again it's not about a real life, but based on a literary character. Always glad if I can help! Andrew -- I'll bet you've seen many. Maggie -- Cagney was good at everything he did in my opinion. Jo-- Yes, I too enjoyed all the great films about the Big Band leaders. Gary -- Did I say David? Oops! I'll fix it. Elephant Man is the only one I have seen on your list. I never have really seen too many older movies. I have seen bits and pieces of Amadeus but not sat down and watched it. Brian's song is a great movie whether you like sports or not. Good ole James Cagney. Love him. Apparently he was a nice guy in real life, contrary to all the tough cases he played. I've seen all those movies growing up. I don't get to watch a lot of movies these days. The only one I've seen is AMADEUS, and I do have it on DVD. I love it but you're right about it being tragic! Even if it was funny too. I completely agree with the fact that the true story of `The Jolson Story` is much more interesting, as with many life story movies. I haven`t seen some of these movies, but they sound quite interesting! Sadly, I haven't seen any of these movies, but I've wanted to see Amadeus. Funny how the life story movies tend to win oscars. Shine, a beautiful mind. I would love to see the steve jobs movie. I remember really enjoying Amadeus when it came out. Not too long ago we watched La Bamba and The Buddy Holly Story with our kids and enjoyed them a lot. Thanks for suggesting some of your favorites! Thanks for the additional comments. It's true that many biopics have been award candidates and winners. I think they touch something in viewers that inspires us or see other lives in a new light. I loved Yankee Doodle Dandy! It could be one of my favorites. I loved all of these, especially Yankee Doodle and Elephant Man. I know you have a lot on your plate, but I was wondering if you could tell me how to get that app that someone designed for the challenge last year, we put on our blogs and it allowed us to click for the next A to Z post or select the random button. I loved it. Stacy -- A patriotic gem like YDD can be might rousing. Melissa -- We don't have it this year and sorry I didn't follow through on checking about it with the blogger who did it. Things just got ahead of me. We'll try to get it back next year. Scots Lass -- Well you should remedy that! It's just dandy! Kristen -- I'm trying to come up with a good mix of films. Hi Lee .. I've seen Amadeus, but not the others .. though Elephant man I've seen snippets of it ... or perhaps the tv adaptation ..